Why is sponsorship a “very good investment”? 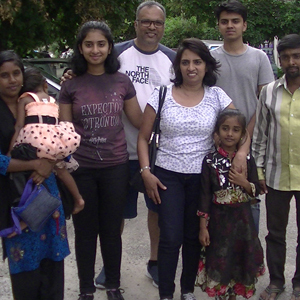 World Vision India child sponsor Girland and his family had a chance to visit their sponsored children. 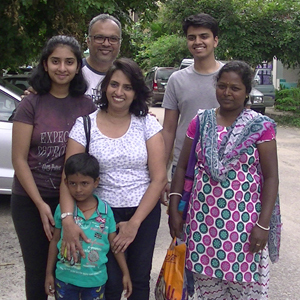 Girland, his wife and two children met their four sponsored children in Bangalore for the first time. Having received a warm welcome from the families, they got to hear from the children, their families and other community members about the work that World Vision India was doing. Then the sponsor took them out for lunch and had a heartfelt conversation with them. “We met the children that we sponsor and various other children too. We are all very extremely pleased to see how well the children are being brought up and looked after by both their families and World Vision India. And we think that it’s a very, very good investment in these young kids’ future. We look forward to continuing our involvement with the programmes and obviously growing the number of children we sponsor. Is every sponsor meeting whom he sponsor? Hi Reshma, we encourage every sponsor to visit their sponsored child, so they can see the impact of their support in the life of the child, his or her family and community. However, due to practical reasons, it may not be possible for all sponsors. Thanks for the motivation Mr. Girland…… Indeed its people like you and me who can bring about a difference in the lives of the children we sponsor. i am very happy that you have been doing very good service to the needy. Thank you and wish you and your team of dedicated people all the Best..May God Bless you in all your endeavours in the service of the needy ..
Can a relative of the sponsor visit the child? Hi Savio, thanks for sponsoring a child from Melghat ADP. We strongly encourage only the sponsor and his/her family to visit their sponsored child. However, in exceptional cases, this request may be considered. Your relationship officer will get in touch with you regarding your query/request. Hi Michael, thanks for writing. Your relationship officer will get in touch with you regarding this. I would some time like to meet the child I sponsor. There has been a gap in my regular payment schedule, however I would cover the gap. Hi Aloke, thanks for writing to us. You could definitely meet the child you sponsor. Your Relationship Officer will get in touch with you. I would like to meet my sponsored child over Skype. I’m not in a position to travel to meet the family. Hi Sujata, thanks for writing in. Our customer service officer will definitely get in touch with you.